Douglas Armstrong sits down before a hearing as his attorney Julian Zebot follows him in the 370th state District Court on Monday, Feb. 12, 2018, at the Hidalgo County Courthouse. Armstrong will have the punishment phase of his 2007 murder trial retried later this year. EDINBURG —The Hidalgo County District Attorney’s Office requested more time Monday to decide whether they will again seek the death penalty against a man who won a new punishment trial on appeal. Douglas Armstrong was sentenced to death in 2007 for the previous year’s murder of Rafael Castelan in Donna. The Texas Court of Criminal Appeals granted Armstrong, 47, a retrial for the punishment phase in November 2017, and the assistant district attorneys trying the case were expected to announce their decision Monday. 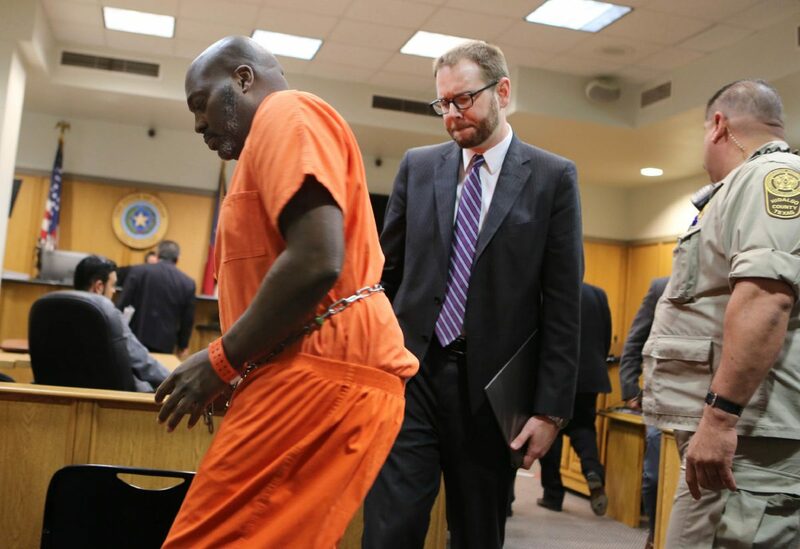 Gonzalez gave the DA’s office until March 19 to determine whether to seek the death penalty, and thus go to trial, or have Armstrong re-sentenced to life in prison without parole, the automatic sentence for a capital felony in Texas. Both parties will return to court for a pre-trial hearing that day.